I was sent a bunch of these Raw Revolution bars for review! The company sells different raw bars that are great for athletes. My favorite of all of these bars are definitely the chocolate and coconut bars! They taste like a Mounds candy bar but obviously much healthier. I like the mini bars that they have because they are only 100 calories. All of the bars tasted really great! I was pleasantly surprised. The bars are Gluten Free, Vegan, Wheat, Corn, Soy, Trans-fat, Cholesterol and Refined Sugar Free! Often when people think of raw bars they think that they may taste gross but that is NOT the case with these. In fact, immediately when I opened the package, I ate 2 of the little bars! Yum! 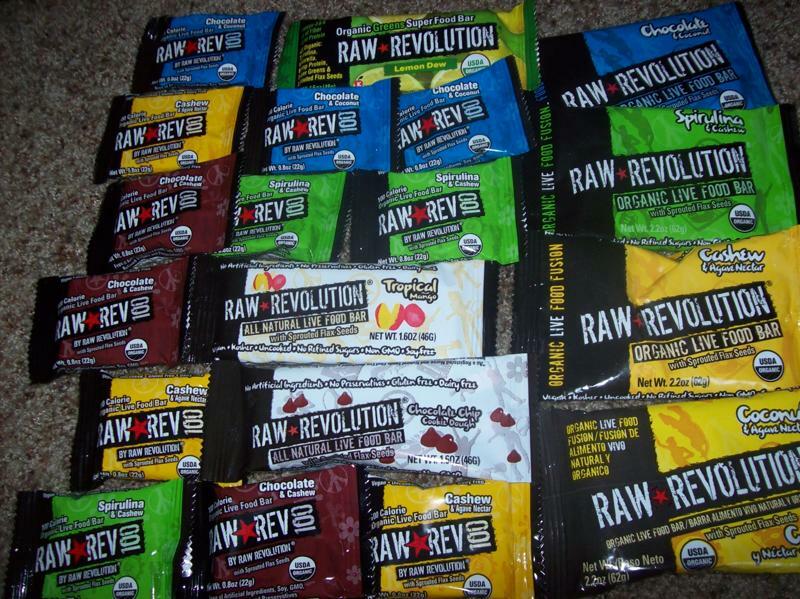 Thanks Raw Revolution for your tasty bars! I've heard those bars are really good, although I haven't tried them yet myself! Just tried the 'Spirulina & Cashew' 100 bar, was pretty good! I think I'm going to see if I can find some of the coconut and / or apple ones next. Nice to find a gluten free energy bar! I really like the chocolate and coconut ones, but should I be concerned that they have such a high fat content? 150 of the 240 calories are fat! Is that going over the daily allowance? I have tried and enjoyed the chocolate and coconut ones. Though I just noticed that 150 of the 240 calories are Fat! Is that ok or is that too much fat in one sitting?